If you want to visit the Aran Islands without the crazy crowds then a trip out there with Atlantic Way Sailing is the best way to go. 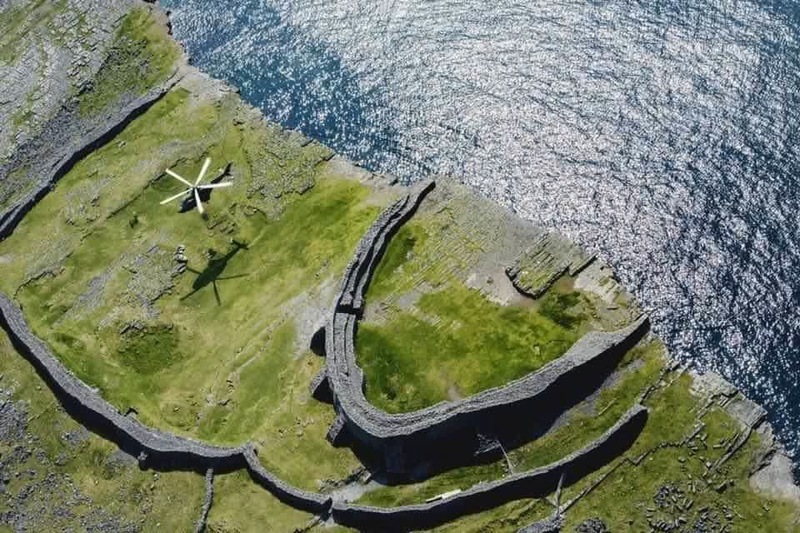 Upwards of 2000 people visit Inishmore every day during the summer of which 80% have the spectacular cliff side fort of Dun Aengus in their sights. As you can imagine it kind of loses its appeal when you are jostling for space to view it, never mind capture a photo without including a pile of strangers all trying to do exactly the same thing. So, how would you like to see it at dusk or better again at sunset and have the place all to yourselves? Well it’s easy if you book an overnight passage to the Aran Islands aboard the luxurious Atlantic Blue yacht which sails there most weekends throughout the summer. For a lot less than the cost of a hotel room in Galway you can sail out from Rossaveal at around 2pm on a saturday, which docks in Inishmore about 4.30-5pm (just as the bulk of the day trippers are leaving on the regular ferries) and sail back again the following day around 12pm, arriving back on the mainland about 2.30 - 3pm. 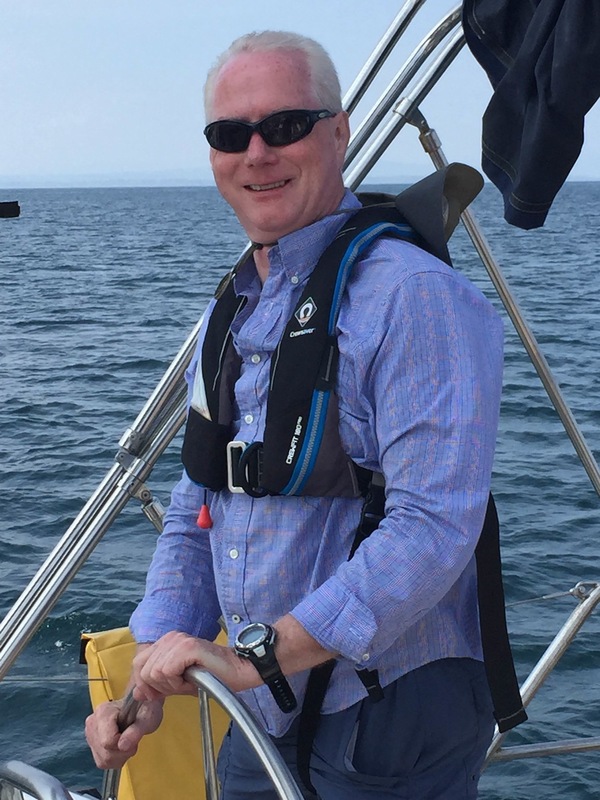 Atlantic Way Sailing is a new company belonging to Cormac Mac Donncha, who has over 30 years sailing experience in these waters. 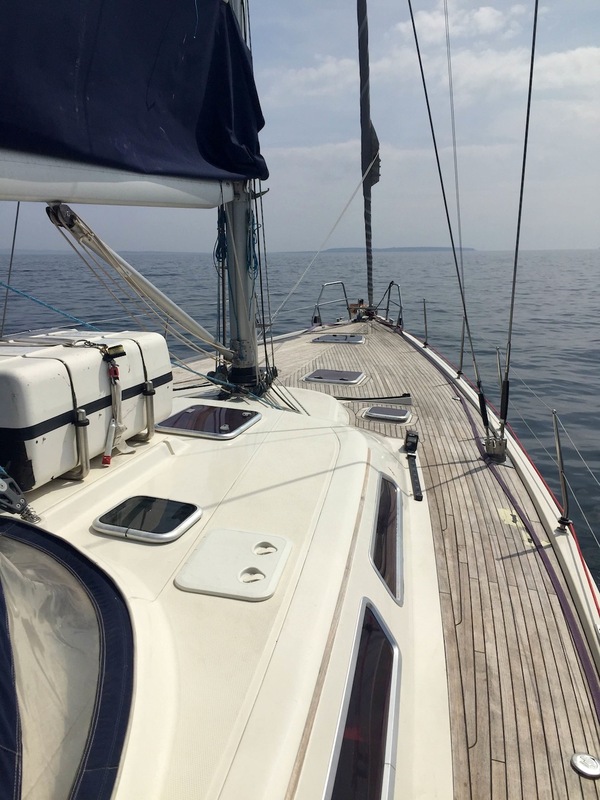 A passionate sailor, he recently acquired a 53' German built Hanse yacht which he sailed back from Italy with his crew of alternating similarly experienced skippers, with the intention of offering sight seeing cruises about Galway Bay and out to the Aran Irelands, throughout the summer. Having been invited to come along last weekend, I expected to have to work for my passage, as in haul ropes rather than sip gin and tonics! Not a bit of it, this boat practically sails itself with automatic winches, roller reefing and even an auto pilot. We were fascinated as much by the unfolding scenery the Twelve Bens of Connemara behind us, Black Head and the Burren to the South with the Aran Islands dead ahead of us, as the ease at which Atlantic Blue cut a dash (literally) across Galway Bay. We had very light winds in fairness but if you are nervous about sailing don’t be this boat is as steady as a rock! Luxuriously appointed with 4 generously, sized double cabins with ensuite bathrooms, there were lots of nice extras, toiletries (on a boat?) soft towels, fleece blankets and even hot water bottles if gets cold. As well as all the obvious, the latest (slim fitting) life jackets, heavy weather gear which wasn't needed on this occasion, thankfully. So having stowed our gear we settled back to enjoy the sail out to Inishmore (about 2 to 3 hours depending on the wind conditions) and admire the views, while Cormac our skipper broke out the sandwiches, tea (beers) and crisps, it wouldn't be a proper Irish picnic if we didn't have crisps!. Talk about a second heaven, on a scorching hot bank holiday weekend when the roads on the mainland were all jammed with people on their way to the beach, we were smugly, cool out, in the middle of the bay on our way to the Aran Islands. Back in town (a slight exaggeration) there are a couple of reasonable restaurants and legendary Joe Watty’s Pub’s to choose from for dinner that night and pints and music galore until all hours but we were all in (shamefully) by 11pm from a combination of sea air, the bike ride and a few too many beers. 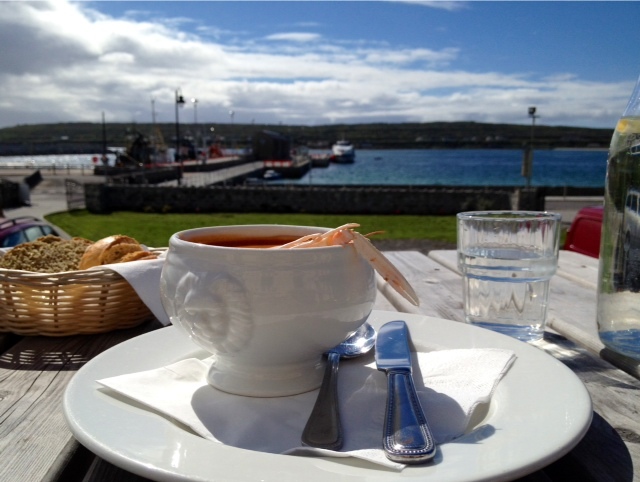 Having slept like babies, we tucked into a lovely continental breakfast on board before having a leisurely wander about the harbour and Aran Sweater Shop, before casting off for the journey back to Rossaveal which was equally as pleasant as our journey out. A little fresher wind wise so we got to hone our sailing skills a little more while drinking tea and eating chocolate biscuits and congratulating ourselves of having found the perfect hassle-free weekend away right on our doorstep in Galway! So, if you fancy doing a bit of sailing or would like to sail rather than drive a section of the Wild Atlantic Way why not take a short (3 hours) City Cruise which takes you out into Galway Bay via the Claddagh, Mutton Island, Silver Strand and over towards the Burren for €50 per person which is brilliant value in Ireland. Or take the overnight trip out to the Aran Islands (as described above) which costs €150 per person including bed and breakfast, again cheaper than a night in an hotel plus you are saving on the ferry fare which is €25 return. 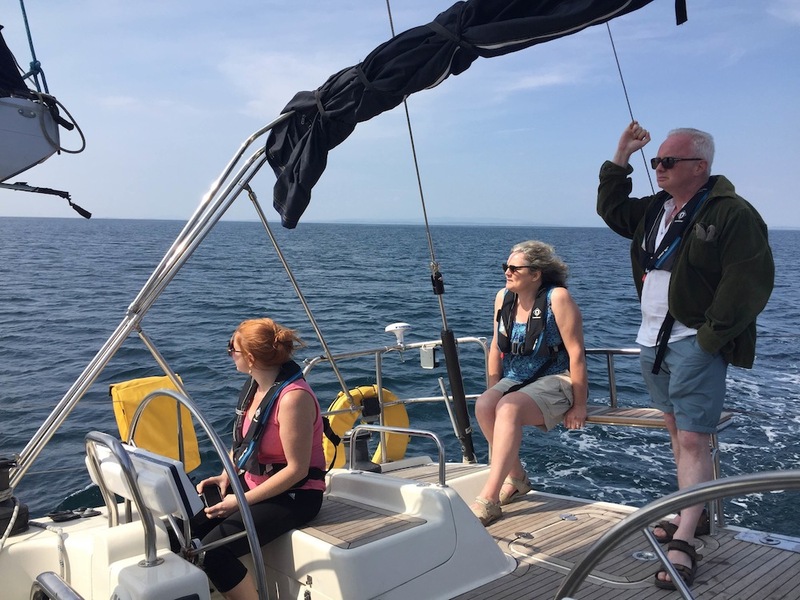 For more information or to book a trip online, click on the following link to Atlantic Way Sailing where you will find a calendar of trips.